Yes, one of those yearbook photos. My name is Cameron Taylor. I am a husband, a father, an educator. One of my favorite sports is kayaking. I truly enjoy being outdoors and seeing nature. I am by no means an expert at kayaking, but I have had some good lessons and I am always learning something new and seeing something new even when I visit the same spots. It has not always been that way. 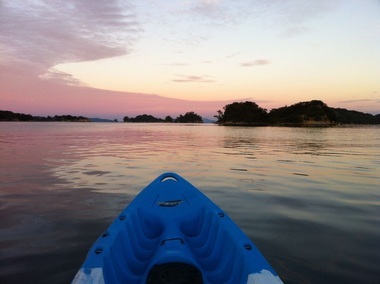 I will never forget the first time I went kayaking. The lessons went well and I even passed the capsize test, but it was that afternoon and the following days that my body ached from using muscles that I hadn't used in a while. Everyone has to begin somewhere. In 2002 I switched from teaching 2nd grade elementary to teaching high school Spanish. It was a huge change. It was like going through my first year of teaching all over again. I survived and so did my students. They learned Spanish but I doubt that many acquired the language. The summer after that first year of teaching Spanish I decided to get some professional development. I went to a three day workshop on a world language teaching methodology called TPR Storytelling. It was fantastic. I learned so much and I returned to school in the fall ready to see my students succeed and actually acquire the language. Years later and I am still learning. I love the Spanish saying, "Descubriste el agua tibia." "You discovered warm water." It means you have found out what is common knowledge. That is how I often feel. I feel as though I just discovered warm water because so many others have already learned what I have just now learned, but that is okay with me. I'm learning! It is my hope that this blog will reflect my learning even if it reflects my discoveries of warm water. If you have a question or comment you may contact me here.